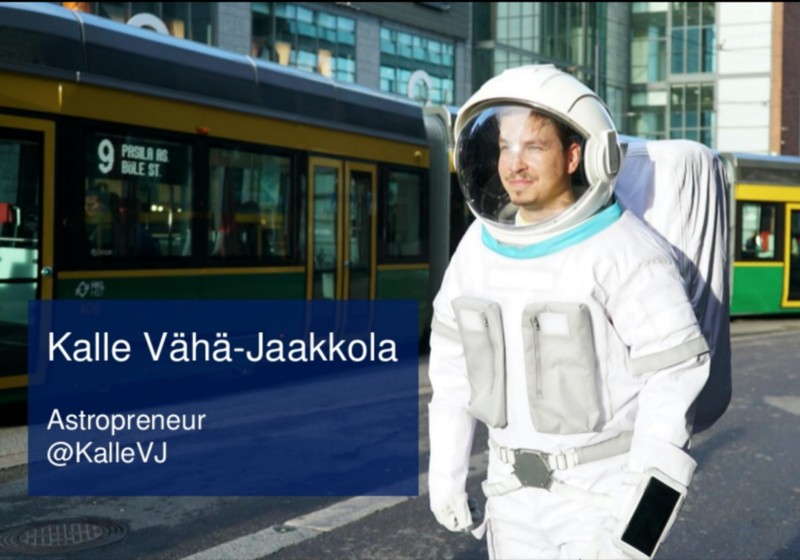 In Orbit Waves, Episode 2, we hear from the cofounder of Space Nation, Kalle V?h?-Jaakkola. Orbit Waves is now available in iTunes. CanCan: What is Space Nation? Kalle: Space Nation, what we do is bring, in a close and relatable way, the new space era for everyone. For everyday people everywhere, creating experiences in media so you can connect and be part of the future that is finally arriving. The future that we were promised decades ago that is finally happening. CanCan: Your vision is to bring space to everyone. In the science community, and even in the sci-fi community, I feel like there is a bit of an elitist attitude sometimes, like there is an Us and a Them, and the people who aren’t part of the world, like science geeks I would say don’t have patience for us normal people. So I really appreciate that about you, you are like a connector between the two worlds. People who know nothing about space, and people who don’t know they are going to be excited about space. Kalle: Exactly! And I think that is the big thing; people who don’t know yet that they are going to be excited. Seeing, like, flying sports cars in space, its just the tip of the iceberg. It is the future for space that will be within reach for everyone. And the old question, to answer it in the way it deserves, “Why go to space? Why should we explore? Why put money there?” For myself it has always been something in my bones, clear and natural. That is the source of all future prosperity and the unity of all humanity, Because if you go to space and see the effect that there are no borders, and you look down and see the biosphere, which is thin around the planet, and realize THAT is the difference between life as we know, and no life. So it makes you think that maybe our own problems, or national problems aren’t so big after all. Maybe we should be taking care of each other and taking care of the planet more. And that is the ultimate goal, that our travels to space as individuals can do. And the big aspect is, what can it mean for “the people,” not just a select few. That’s what we want to create here. CanCan: What is your story? How did you get so deeply connected to space and space lifestyle. Kalle: Basically it started in 1981 when I was born. I think my earliest memories are when I was three years old. There is no singular event that created that fascination. It has been there as long as my memories go. So space, for me, was a close, warm, natural hopefully thing, for as long as I can remember. For me I grew up as a farmer’s son in a small village of 3,000 people in the middle of the countryside in Finland. During summer time, the sun doesn’t go down much, but in the winter time, the sun doesn’t come up. So there is snow, and there is stars. Then you can see awesome things like the full moon and how that sparkles on the sea of snow, so I think that kind of probably had something to do with my fascination. But when I was a young kind, this was always natural for me. I read science fiction books, I learned about moon landings, that inspired me. I watched Star Trek of course, and I might be a bit of a nerdy-geeky space enthusiast in that sense, but when I grew up I realized that space is not so relateable for everyone. For everyone, space isn’t close. For many people it is far, and fantasy. I realized that in order to change and make the new space era happen, we don’t JUST need technology or government collaboration with private companies, which are an important part of it, but we need more people to be a part of this, more people engaged with it. And that effects many areas of it: demand, funding of space agencies…just the general perception of why we are going to space. CanCan: I find that when I talk to people about Space Nation, they are really intrigued. What do you think is going to be the most surprising thing that Space Nation brings? The biggest “wow” factor about space nation? Because its all crazy, in a good way. Kalle: I think the first big thing will be when we send the first Space Nation astronaut, so that its not the selected few or the elite, but a citizen astronaut. The first “everyday person” to go to space. I think its a pretty huge thing if you think about that less than 600 people have been to space in all of human history, and now we are creating a program that anyone in the world, ok you have to be an adult, but anyone in the world has the opportunity to do that. We will send children later on, of course, with a return ticket, but that will be the first one. Many of these things will be gradual, but happenings like sending the first person the space, that will wake people up. CanCan: That is such a good point; I was a communications student in the early 2000’s, and they told us that by 2012 there would be no analog, over-the-air tv signals anymore. They would all be digital, in the “future”. And I thought “That is not true! How can TV as we know it change?” But now, who remembers the old ways? And that wasn’t even that long ago. Kalle: Exactly! We are living in such exponential development in so many areas, and I think the important thing is, rather than how technology effects civilization, but how much, truly, in essence, humans and society evolves. I think the next thing we need is people going permanently into space. CanCan: I think one reason that the moon landing, space exploration feels very irrelevant to the average citizen is that we don’t know the tangible benefits that space exploration has brought to life on Earth. I think part of it is exciting people about the possibilities. I heard recently they successfully controlled a drone from space, on Earth. And that means that they can do it in the opposite direction, and use a drone to mine minerals in space, on other planets, or a meteor, and find stuff that would benefit us on Earth. Kalle: Exactly, there will be those kinds of things, the pursuit of humanity advancing to space will drive our technological advances. We also get resources because we need to recycle, we need to take good care of our resources here on Earth, but there is a lot of us people and our living standards are rising. So the math necessitates that we will need to go to space and take resources from there also. Energy-wise, there is unlimited solar energy in space, and there will be technologies that will allow us to create and harness the energy in space, and use it on Earth. That will be kind of a poetic, beautiful way to change peoples relationship with space. So, I wish I was this kind of oracle because then I would know how to make a lot of money to use for the benefit of humanity, but its not so easy. CanCan: If we do invent a time machine, there are a lot of things I want to go back in time and be the inventor of them. CanCan: I have a long list. I was thinking about how when the internet first came around, we could print out driving directions off of the internet. It was the best thing ever, you didn’t have to read a map anymore. It could tell you, turn right in 500 feet…but how could we ever know that one day we would be getting directions from the computer speaking them to us in real time? We would never know that in the 90’s. Kalle: Exactly. Or when it happens, and how it happens. Of course those who watched Star Trek knew it would happen because many of the things from the 60’s series have happened basically. CanCan: When we use to do car trips when I was a child, my parents would have maps and highlight the route. Someone about 10 years younger than me asked, “Well what did you do before GPS?”. And I said, we just yelled at each other alot. There was a lot of fighting. It was very stressful. CanCan: And now that’s eliminated. Vacations used to be very stressful because we didn’t know where we were going. Kalle: Exactly. There was the blame game and everything if you got lost. CanCan: So like you said, once we get in space there will be bonuses that we don’t even know about. Kalle: Exactly, its in our DNA, basically, as a society. Some people might have it more dormant, but we need to explore, whether its how things work, or seeing what is on the other side of that mountain or valley to see what is there. And if we don’t act on our nature, we will be acting against our species nature, so we need new frontiers, new adventure, expansion, for better or for worse. It will be not just as a society, but as an individual, finding our place in the universe, answering those big questions. CanCan: It definitely sounds like it shrinks the ego while expanding the perspective. What is the biggest challenge being in your position? You are a tireless evangelist for Space Nation and for your values. What has been the biggest challenge in these three years that you have been doing this? Kalle: One thing is communication, because it ultimately always comes down to communication. Having a message about the future, but you need to relay and communicate that in different ways for different audiences, and also, you need to find the best people, because ultimately you don’t do it alone. How can you build the best team and crew for Space Nation, finding them. That is one of the biggest challenges. CanCan: I can see that. Even in my position with Space Nation, I find that people have preconceived ideas about what space is and space lifestyle, and I just want them to be a little more open to change those ideas. Kalle: Yes, we need to look at things differently and think differently than we have gotten used to in the past history. One thing is that people perceive space as hard, expensive, risky, far, fantasy. And that’s not true, really. Those ideas exist between our ears, and its as hard and impossible as we make it. So there is a certain kind of attitude and looking at our own potentials inside our heads that we need to look at first. CanCan: Yeah that has to sink in. What are you most proud of that you have done with Space Nation so far? Those are the kind of things I feel most proud of, when you actually see people’s thrills and inspiration, thats priceless. CanCan: Yes, when you said that about the girl having so much joy in Argentina that gave me chill bumps, and I’ve heard you tell that story before. It did it to me again! Kalle: You need to learn these and make them happen more and more. Relay it for more people. CanCan: Yes! Where can we find you online? CanCan: Thank you Captain for joining us today! CanCan This has been Orbit Waves with your host Amazing CanCan. Connect with us online at Space Nation Orbit, @SpaceNationOrb on Twitter, and @SpaceNationOrbit on Instagram.